Our department offers a variety of events for undergraduate students. Each September, new students are invited to the New-Majors Reception to kick off the year. Various faculty and students present on opportunities to get involved in the department, from research to outreach to student groups. The reception gives students a chance to meet their classmates for the first time and to make new friends. The Physics Department's version of the campus First Look Fair, the Research Fair is an opportunity for new and returning students to jump into research at the beginning of each year. Held annually in October, the Research Fair sees faculty members present on their areas of study and invite students to get involved. Research is a vital component of the Physics undergraduate experience, so all majors are strongly encouraged to attend. Held annually in the spring, the Research Showcase is the bookend to the Research Fair. Undergraduates present research that they conducted over the course of the academic year and previous summer. Topics of posters and talks include internships, REUs, and significant campus research. The Physics Department organizes a number of activities on Maryland Day. In 2018, we presented demonstrations sponsored by the Society of Physics Students and Women in Physics, and gave hundreds of visitors a taste of our famous liquid nitrogen ice cream. 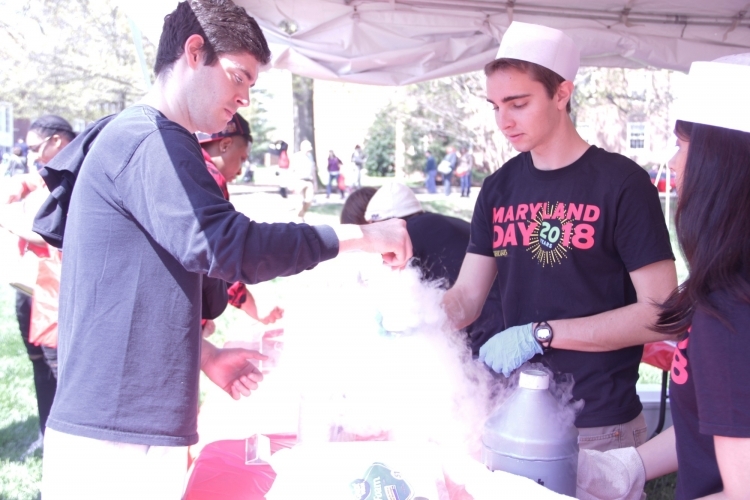 Be sure to visit campus for next year's Maryland Day for more exciting Physics activities!